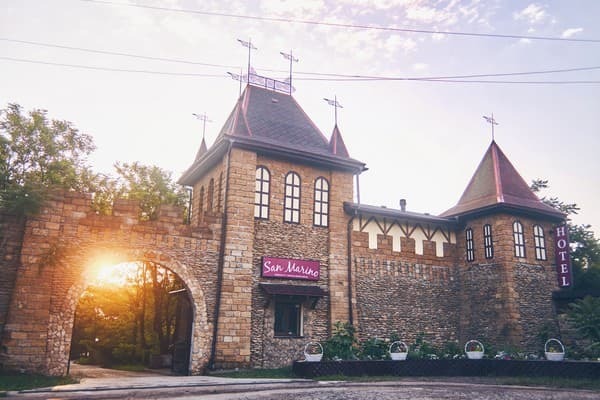 Hotel "San Marino" is located on the Black Sea coast in the resort village of Morskoye. 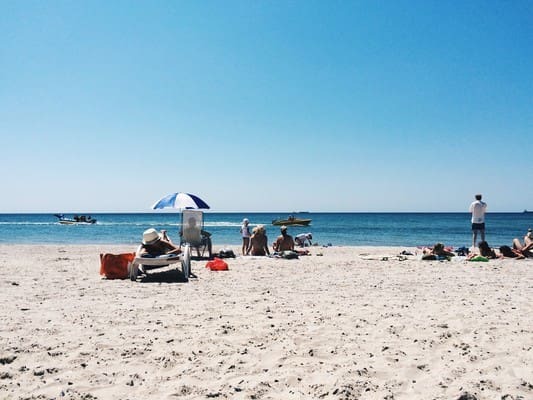 The complex offers tourists to stay in one of the two modern buildings and enjoy a rest on 3.5 hectares of well-groomed territory with its own sandy beach stretching for 100 meters. The hotel has 54 rooms equipped with comfortable furniture, air conditioning, refrigerator, TV, private bathroom. To the guests of the hotel "San Marino" you can use the swimming pool (free of charge), parking (20 UAH / day), 8 gazebos with barbecue (free of charge, on reservation), table tennis, playground, fitness. Tasty meals can be enjoyed in the spacious, bright hall of the restaurant, located on the first floor of the second building of the hotel. The distance to Nikolaev is 87 km, Odessa - 64 km, the resort zone "Koblevo" - 15 km. 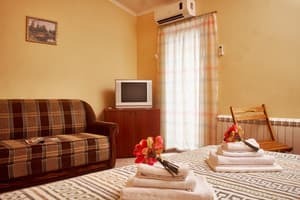 Description of the room: Rooms are located on the 4th floor of the dormitory building of the hotel and consist of a bedroom, bathroom and balcony. All rooms are decorated in a contemporary style and designed to provide maximum comfort and functionality. 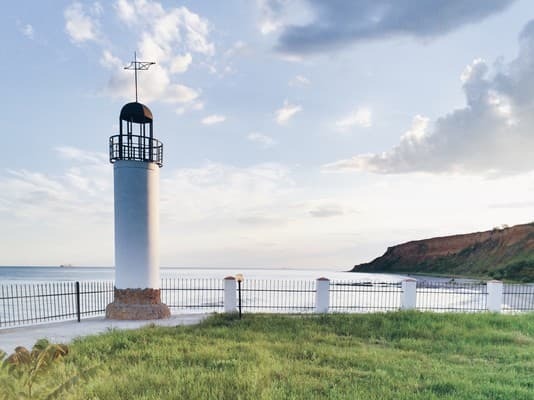 It overlooks the sea or the park of the hotel zone. All rooms are air conditioned. Total area - 18 square meters. Maximum capacity - 2 people. Double bed or twin beds. Description of the room: The rooms consist of a bedroom, bathroom and balcony. All rooms are decorated in a contemporary style and designed to provide maximum comfort and functionality. It overlooks the sea or the park of the hotel zone. All rooms are air conditioned. Total area - 18 square meters. Maximum capacity - 2 people. Double bed or twin beds. 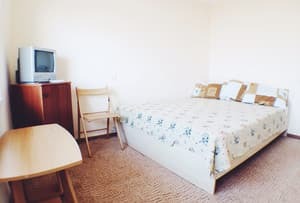 Description of the room: The room is located on the fourth floor of the dormitory building of the hotel and consists of a bedroom and a bathroom. Description of the room: The suite consists of a bedroom, bathroom and balcony. Total area - 24 square meters. Double bed. 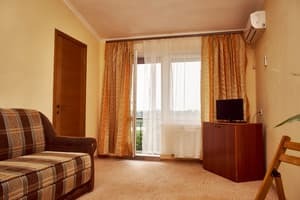 Description of the room: Two-room apartment consists of living room, bedroom, bathroom and balcony. Total area - 30 square meters. The cost of additional space is 70 UAH. Children up to 3 years old are provided with a cot (on request). Children under 12 years old stay free of charge (without extra bed). 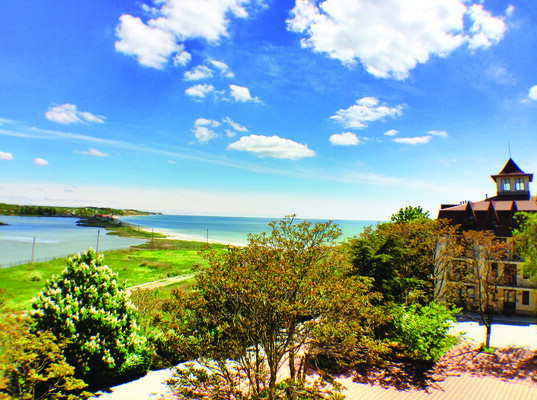 Nikolaev region, resort Koblevo, village Morskoe, st. Marine, 22 GPS-coordinates: 46.612835 31.269486. 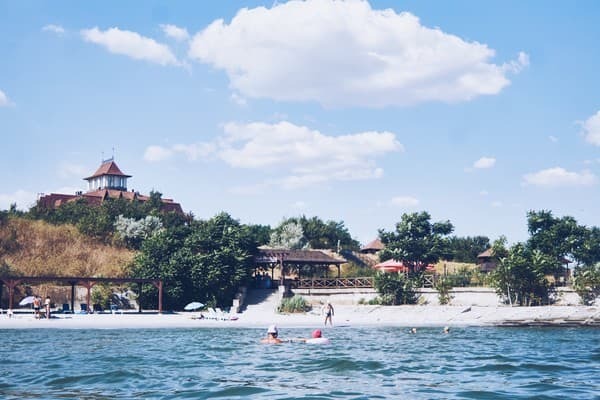 The distance to Nikolaev is 87 km, Odessa - 64 km, the resort zone "Koblevo" - 15 km. 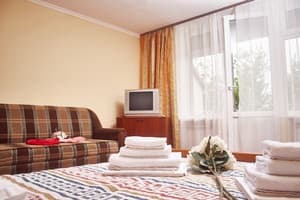 By train to Odessa, from Odessa railway station or Privoz station bus station by shuttle bus "Odessa-Nikolaev" to Koblevo bus station, then to the hotel by taxi (5 km). By train to Nikolaev, then from the bus station by shuttle bus "Nikolaev-Odessa" to the bus station Koblevo, then to the hotel by taxi (5 km).